Eastbound runs special Photographic tours and journeys in India and the sub-continent that are led and escorted by Abhishek Hajela. Abhishek is a Travel photographer based in New Delhi. He recently won the Nikon World Photography Award in the Emerging Talent Category for 2010-2011, for his photo titled ‘Just before the sacred dip in the Ganges’. His project on Spiritual India (The Naga Sadhus – Naked Saints) also got nominated by the National Geographic ‘All Roads Photography Program’. Abhishek works closely with John Isaac, one of the most respected and prominent photojournalist of this century! They conduct and lead two to three photography tours in a year in tandem within India and its neighboring countries. His last trip with John was in February 2013 to Mahakumbh, the biggest festival on Earth. In March 2013 he conducted another photographer trip with an U.S based photographer - David Wells who is one of the Olympus visionaries. His images have been featured in the Indian and American media in titles such as TOI Crest, Air India Magazine, HT MINT and the Outdooor Photographer Magazine; and are featured in the Indian Ministry of Tourism’s ad campaigns. 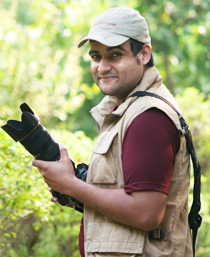 Abhishek has over five years of experience accompanying and leading photography trips to India and Sub-continent and exclusively develops and leads Photo Tours for the Eastbound Group. Explore the rich heritage and the vivid design and architecture heritage of India. The sheer myriad and multifaceted genres of art, decor, design and architecture of India range over different time period, styles and will constantly challenge and amaze you! With Eastbound we have a leading design and art expert who will design and customize your tour keeping in mind your preferences and interests. Eastbound’s Culinary & Food Voyages highlight the amazing food heritage and experiences of India. We will showcase the local produce and amazing variety of spices and herbs that India offers. We will take you to sparkling food soirees in India where food curators will tell you knowledgably about food; and you will eat as the locals do. At Eastbound, we have engaged the expertise of India’s leading food expert and curator who designs food menus and programs that will leave you hungry for more! Discover the artheritage and its rich line of painters, budding artists, art camps, galleries that and cultural history that India offers. Participate in art openings, art-shows, tours, concerts, workshops, and demonstrations through the year. India simply bursts with festivals – each month, each day there is a festival or an occasion that is celebrated in India. From the colourful Holi, to the sparkling fireworks of Diwali, the many religions of India celebrate a number of festivals with great pride and oneness. Travelling is much more that just visiting monuments and sight-seeing. It’s about meeting people in their local setting and seeing the way they love, work and play! We will connect you with the people who matter, from various walks of life who will impact you, engage you and will remain your friends, and stay with you for a long time to come! Find out what inner peace and spirituality means from the country that invented those words! Rich in traditions, rituals and holy places, let us find the sacred destinations in India for you that suit your frame of mind and to maximize your spiritual experience. Find your inner peace, go on a deep inner spiritual journey and re-discover yourself. Our wellnessvacations will renew your mind, body and soulwith carefully chosen destinations, selected for their deep sense of serenity and a palpable spiritual energy.